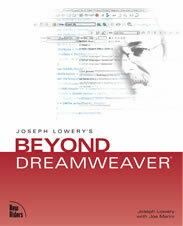 Beyond Dreamweaver is a need-driven book. I've seen more and more companies moving toward content management systems and looking for ways to integrate their authoring tools. I've gotten numerous emails from Web developers looking for guidance and techniques on Section 508 compliance. I've been approached at conferences with questions about all sorts of multimedia technology, including SMIL. The initial section of the book is devoted to these particular cries for help. As you look over the book's table of contents, you may notice a pattern. There is a progression from the more specific – CMS and accessibility – to the more general – cross-product integration and broad-spectrum extensibility. I wanted to cover Dreamweaver as I see it: a multi-layered tool that grows in scope the deeper you dig. In the middle layer, you'll find an emphasis on Dreamweaver power features including templates and XML connectivity. Armed with in-depth knowledge of capabilities such as these – and the working code examples – your efficiency and production level can soar. The last part of the book reflects a deep love of mine: extensibility. It's true that I derive great personal enjoyment from building extensions – it's a left brain/right brain kind of thing – but I don't expect everyone to begin building Dreamweaver extensions. No, I'm more interested in exposing the possibilities of Dreamweaver extensibility to a wider audience. Think of it as a paradigm shift: once you know something can be done – whether it is cross-communicating with Flash and Dreamweaver or adding whole new layers of authoring functionality with C-level extensions – you can make it happen.